The Game Party franchise is one of those games that every game reviewer loves to hate on, but I was only given six months to not only design this game but also develop it with only one programmer, one artist and myself designing many of the mini-games. 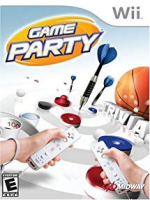 Despite this, Game Party 1 went on to make an insane amount of money and a political battle between FarSight Studios and the publisher over control over Game Party 2 and 3. My development role was mainly on Game Party 1, while I would continue to be responsible for coming up with designs for the mini-games for follow up games.